Check out the official homepage for the preliminary Running Order. PS: You do not have a ticket for this year? They´re still available! For your new year WarmUp! It is time to present you the complete program for this year’s Hamburg Metal Dayz! Let’s start with the bands: Beyond The Black are the final act to rock Markthalle Hamburg on Saturday, September 26! These metal upstarts add their acclaimed mixture of power, symphonic and gothic metal to the sounds of W.A.S.P. and Axxis. We also can confirm the whole supporting program as well as the final Running Order with times. In the beginning of this week Billy Milano announced the end of his musical career which als led to the cancellation of the upcoming M.O.D. tour including the W:O:A performance. 4 new Metal-Battle finalists confirmed! ITCOM, Materia, Renaissense and Scratch The Floor have won the final rounds in their home countries and will now proceed to the Metal-Battle finals at Wacken in August! LEMMY Black Edition Steelbook – Big Raffle! Lemmy – The Movie will be released as limited Black Edition Steelbook on DVD and Blu-Ray on May 29th! To celebrate the upcoming release we will raffle 5 DVD and Blu-Ray editions of this awesome piece of music history. it is time for a big change regarding the W:O:A merchandise. The distribution was done by our partner in the last few years, but now we will take over again. The whole range of products will be available at one place and integrated in our well known network! The W:O:A merchandise is exclusively available at Metaltix.com right now! You can find all articles at the Full Metal Shop powered by www.metaltix.com! This means that you are now able to buy the latest t-shirts, pants or accessories together with the tickets for the next awesome concerts! The shop offers over 100 articles and the whole range of fan memorabilia! Next to the official W:O:A merchandise, you can also find the stuff from our other events – starting with the merchandise from the Full Metal Cruise. And of course, everything comes with the known Metaltix service quality. The advantages for you are obvious: You can order both tickets and merchandise at once. One customer account and one order are enough to order for example a Full Metal Cruise shirt and tickets for the upcoming Hamburg Metal Dayz. Whether you need a complete load-out for the upcoming festival summer or just a funny metal gadget for your home – the Full Metal Shop powered by www.metaltix.com will help you out! And if you aren’t into online shopping: Our local W:O:A Info Office & Fan Shop can be visited at several days of the week. Shop till you drop! Please find the opening hours HERE. Festival Alphabet 2015 is online! The reworked Festival ABC for W:O:A 2015 is online. Where do I get that? Where do I have to go, if i encounter a problem at the festival? How many stages are there? Here are the answers! If you take a cloe look, you will notice one or more innovations – based on your feedback, we optimized the area, the setup and the flow of the festival once more. We will explain the innovations before the festival starts. Last weeks package added a colorful supporting program with some worth hearing bands to our line-up. Amongst those bands were Santiano, Steve ´n´ Seagulls, Feuerschwanz and many more. Waterkant X-Mas Bash & Ruhrpott Metal Meeting – now on pre-sale at Metaltix.com! A calm Advent season? No way! On the first weekend of December, Waterkant X-Mas Bash in Hamburg and Ruhrpott Metal Meeting in Oberhausen will open their doors for a different kind of celebration! Look forward to one, respectively two days of Metal madness! For both events, Accept and Hammerfall have been confirmed. Ruhrpott Metal Meeting even adds Sodom, Primordial, Alestorm, Dr. Living Dead!, Beyond The Black, Deserted Fear, Gloryful and Final Depravity. For both events, more acts are to be announced, so get your tickets now – exclusively at www.metaltix.com! 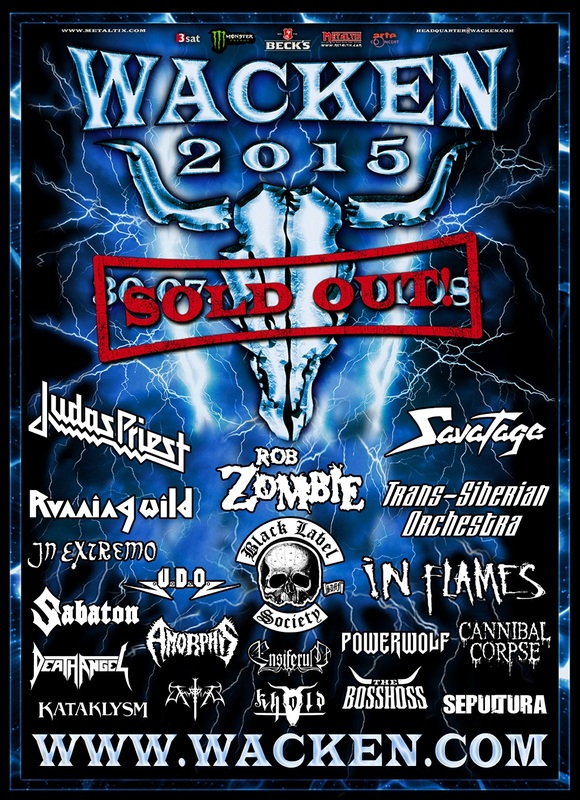 with Accept, Hammerfall and many more. with Accept, Hammerfall, Sodom, Primordial and many more. Our popular official Wacken Open Air app shines in a new and bright light! A completely new version of the app with new features and focus areas is ready for take-off! The app gives you access to the latest news, the complete list of bands at the event and the running order.You can also add single bands and events to your personal favorite list to get a notification right before the band hits the stage! And if you have problems to find the right stage: A detailed map of the festival area is included, too. Running Order – the running order of the festival – find out which bands play when and where! Photo Booth – upload your pictures to the Wacken cloud and become part of the community!